Note: This post borrows entirely from the VAPN feasibility study website, but the information is perfectly relevant here. New techniques are emerging in the digital landscape including the 802.11 MeshNet folks and impressive voice channel digital modes by FLDigi and the NBEMS efforts. Competition is a good thing, but it’s important to see where packet fits in this new digital landscape. There is no doubt other digital modes belong on the graph in figure 1 (i.e. Pactor, Clover, etc. ), but the VAPN is focusing on minimizing footprints in many ways including spectrum use in the MF/HF segments. Hence the focus for the MF/HF bands is on HF Packet and Robust Packet. An AX.25 BBS/Chat capable node is one of the few applications that can service nearly any band from DC to daylight with a consistent, centralized and well known interface. One thing is abundantly clear about figure 1, in the middle ground VHF and UHF bands, 9600 packet is no longer a luxury, but a necessity. 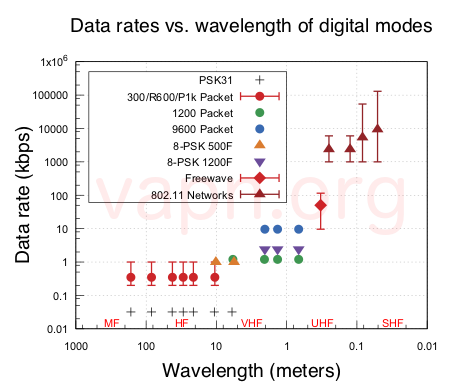 Therefore, if AX.25 is to keep pace with competing developments, new packet projects must consider 9600 bps VHF/UHF ports along with 200-600 bps HF packet frequencies. Add a telnet port on a Mesh network and the user has a broad palette of choices for message movement. Frequency diversity is a key feature of the VAPN.